Similar to Ukraine’s coal and power sectors, the current conflict and economic crisis is having an impact on the country’s iron ore production, which may lead to a significant decrease in the coming years. Statistics indicate that in recent years, the industry has developed rapidly with an average annual growth rate from 4% to 7% with bright forecasts for increases in exports. Most of the predictions at the end of 2013 said the general prospects of the industry were very favorable. However, 2014 was a real shock for iron ore producers in Ukraine. The problems began in March, when as a result of the Russian annexation of the Crimean peninsula, Ukraine lost the Kerch iron ore basin, which has the country’s second largest reserves of iron ore, and all of the projects implemented there. According to Ministry of Natural Resources statistics, the Kerch basin accounted for about 14% of Ukraine’s iron ore reserves. The Russian annexation of the peninsula created another serious problem for iron ore miners as Ukraine lost access to the Crimean ports, which shut down the potential for increasing exports. Today, the mainland ports—Odessa in particular—are overloaded. Exports through Odessa are associated with higher logistic spends. The greatest problems, however, came later. When the armed conflict began in the East, logistics for most iron ore producers were disrupted. Ukraine’s largest iron ore producer Metinvest, for example, faced serious challenges. Several of its plants for ore enrichment, operated by the Azovstal subsidiary, are located in the Donetsk Oblast (or region), an area now controlled by the pro-Russian separatists. Further complicating matters, in April 2014, the Ukrainian government decided to increase the tax burden on iron ore producers by six times to generate additional funds to support the country. By September, the government was considering an additional tax increase. So far, it has not been approved, but remains a possibility today. According to the head of the Federation of Metallurgists of Ukraine (FMU) Sergei Belenky, the “rental fee” for iron ore was recently increased to $3.60/mt from $3.10/mt. In the first quarter of 2014, the royalty stood at $1/mt. With iron ore currently trading for $50/mt to $60/mt, he said several Ukraine iron ore mines could go bankrupt in the next year or two, which will result in the loss of 40,000 jobs with a knock-on effect of about 100,000 jobs in related industries. Iron ore production in Ukraine grew to 81.2 million mt in 2013, an increase of 5 million mt or 4.8% compared with 2012. The mining business reported increases for all types of products, including marketable ore (715,000 mt or 5.3% year-on-year) and concentrate (635,000 mt year-on-year or 1.6%). Forecasts from Ukraine’s Industrial and External Expertise (UIEE) published in the beginning of 2014 projected that iron ore volumes should reach 82.1 million mt, a 900,000 mt increase (or 1.4% year-on-year), but it actually dropped by 2%. In January, the pace of decline accelerated to 13% compared to January 2014. This was expected to be temporary and related primarily to the decrease of iron ore prices worldwide. Referring to foreign experts, Ukraine’s Ministry of the Economic Development at the beginning of the year estimated the price for iron ore to be more than $100/mt. The average cost of production in the Ukraine is estimated to be $30/mt to $40/mt and that figure probably decreased during 2014 as Ukraine’s currency (the hryvnia) depreciated against the dollar. Ukraine’s costs are relatively inexpensive compared to Russia’s costs of $40/mt to $50/mt. Forecasts for production growth have been made based on a projected increase in demand from both foreign and domestic markets. At the beginning of 2014, exports of iron ore were expected to total 38.3 million mt, which is 500,000 mt higher than 2013. At the same time, domestic demand was also projected to raise from 46.3 million mt in 2013 to 47.1 million mt in 2014. Iron ore production, however, has been cut short by crisis. Steelmakers reported a 14% year-on-year decline and and a loss of $916 million for the first nine months of 2014, which saw a decrease in domestic demand for iron ore. Iron ore producers had to increase prices for domestic consumers. Ukraine has 49 known deposits of iron ore, with total reserves of about 28 billion mt, which amounts to 8% of total world resources. The deposits occur in three grades: rich (with iron content 51%-58%), relatively poor ferruginous quartzite (with an iron content of 30%-34%) and oolitic brown (with an iron content of about 38%). 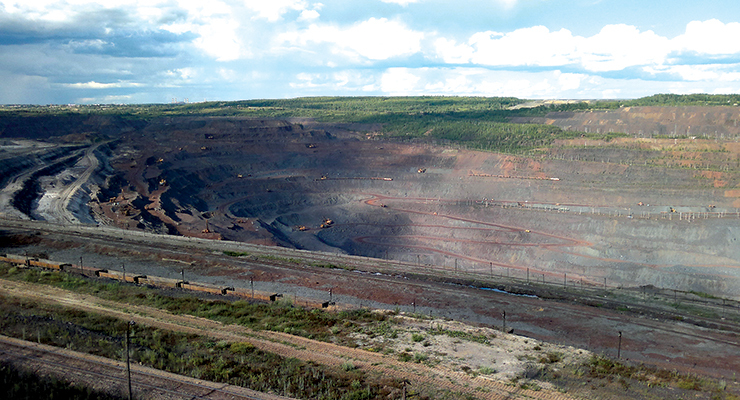 About 70% of all iron ore production is concentrated in the Krivoy Rog Basin, which is the largest basin in the post-Soviet era with total reserves of 20 billion mt. This basin is located mostly in the territory of Dnepropetrovsk Oblast, not far from the battle zone between Ukrainian troops and pro-Russian rebels. A number of large-scale iron ore projects were slated for production in four other basins, including Kremenchug, Belozersk-Orekhovskaya, Azov and the Kerch, but so far they have not been implemented. In the middle of 2014, Russian authorities from Crimea promised to launch mining in the Kerch basin, but so far no investment projects have been announced, and experts in general say that given the unclear international status of the peninsula, any prospects of such projects would be quite questionable. Ukrainian iron ore mining costs average $30/mt to $40/mt. To prevent a “financial catastrophe,” Kiev increased the taxes on subsoil resources by five to six times in the beginning of 2014. As a result, the tax (or royalty) to mine and produce iron ore jumped from about 2.5% to 15% of production costs. At the end of 2014, the country’s government was planning an additional increase that would roughly double the current tax burden. The share of taxes in the production cost may amount to 30%. This initiative has been announced by the representatives of Ukraine’s Ministry of Finance; so far, it has not been approved. Unless prices worldwide increase substantially, and there is no sign of that in the near future, the new taxes will likely bankrupt Ukraine’s largest iron ore producers who will be unable to compete with Russian counterparts. “The government’s initiative to increase the fee for the extraction of iron ore will bring a negative impact on the development of mining and metallurgical complex of Ukraine,” said the lead analyst of UIEE, Dmitry Zheltyakov. “Over the past year, the price of iron ore in the world fell by about 30%. Given this fact, it is obvious that today is not the best time to raise fees for iron ore production. “This may seriously reduce the competitiveness of Ukrainian enterprises, because now the mining companies in the world are fighting for every dollar. For example, today, Russian iron ore producers have substantially lower production costs than the Ukrainian companies,” Zheltyakov said, adding that currently the charge for the use of mineral resources in the Ukraine is one of the highest in the world. The measure makes no sense. It will not generate revenue if miners are bankrupt. In fact, just the opposite. The government will have to pay for social services for displaced workers. “When Ukrainian mining and processing companies stop operating, the government will lose several billion hryvnia in taxes. It will also contribute to rising unemployment in regions where the mining companies are based,” Belenky said. Russian companies, he explained, could import iron ore from other sources too. Without guarantees from the government, investments in Ukraine’s iron ore business will likely cease. “Russia has much better conditions for mining and processing iron ore. They pay less for gas and electricity for metallurgists,” Belenky said, adding that in Russia the tax burden for iron ore producers already is five times lower than in the Ukraine. His opinion is also shared by Chairman of the Independent Trade Union of Miners (ITUM) Mykhailo Volynets, who made an official appeal to Prime Minister Arseniy Yatsenyuk, members of the cabinet and the deputies of the Verkhovna Rada, asking not to allow a further tax increase on subsoil resources. Volynets in particular believes the increase in rates probably will let the government temporarly increase the income of the state budget. But in the long term, the initiative of the second increase of tax burdens on iron ore producers during the recent year will result in iron ore producers ceasing to exist in the country, just like a number of other segments of the mining industry. “Difficult conditions for mining iron and uranium ore, as well as zirconium and other nonferrous metals in Ukraine, along with a decrease of prices for commodities in global markets have already placed once profitable industries on the brink of survival,” Volynets said. At a roundtable discussion on the socio-economic implications of increasing the tax rate on the extraction of subsoil resources for Ukrainian industry, Deputy Minister of Industrial Policy Alexander Kalenkov explained that it is necessary to increase the taxes on iron ore and even coal producers, and the miners will have to learn how to work with the new costs. Many of the mines still use antiquated equipment. The biggest concern is that within the next two to three years, Ukraine will be unable to export iron ore to China. Industry analysts believe deliveries of iron ore from Ukraine to China will soon become unprofitable. Urainians producers would need a price of $76/mt to $80/mt, which would be $10/mt to $20/mt higher than current spot prices, to break even. Fluctuations in foreign exchange rates could help their case. Topolyuk estimated production costs for iron ore concentrate at $30/mt to $35/mt, and iron ore [pellets] would be $45/mt. “Taking this into account, the cost of shipping by rail and sea transport, with the current price of the concentrate in China at around $60/mt, profitability of iron exports from Ukraine are already now close to zero if not less,” Topolyuk said. The high margin for pellets is observed thanks to the high prices for these products, which are currently standing at $123/mt. This, according to Topolyuk, so far allows exporters to earn about $20/mt of production in 2015. However, this is about two times lower than in 2013. “Most likely, the margin will decline further in the coming years,” Topolyuk said. Experts at the UIEE estimate that with prices in China below $75/mt, Ukraine will lose $800 million to $900 million per year. China is not the only customer for Ukrainian iron ore, but exports to Europe will not be able to completely offset Chinese exports. China accounted for 75%-80% of all Ukraine’s iron ore exports. Currently, the miners are scared by forecasts that world prices for iron ore will remain at or below $60/mt. “I don’t believe that at such prices we can conduct any export supplies to China. Moreover, I don’t think that our company and a large part of other mines in Ukraine will survive the crisis of low prices. When such crises happen, the producers with the highest production costs and the lowest margin leave the market first. And, I believe that thanks to our authorities, we should prepare to stop export supplies, cut production and possibly even close operations,” said another Ukrainian iron ore operator wishing to remain anonymous. At the same time, it is clear the Ukraine has no chances to affect the global prices for iron ore production. With the total export of 38 million mt/y, Ukraine accounts for only 3% of the global supply. A fall in domestic demand forced mining companies to turn to exports. The future of the country’s iron ore export as well as the future of the industry in general is now quite questionable.